In just over 10 years, more than 100,000 Kerlink installations have been rolled out for more than 330 clients in 69 countries, with major deployments in Europe, South Asia and South America and Oceania, for tier-one telecom operators, transportation companies and large utility players. With its core range of leading IoT products, solutions and expert professional services in place, Kerlink is focusing on delivering the best-in-class IoT network building blocks to ensure the full success of the IoT-dedicated value chain, leveraging LoRaWAN LPWA technology running on license-free frequencies. Kerlink aims at crystalizing a strong ecosystem of partners around its IoT network solutions not only to unlock the creativity for connected devices design but also to trigger the conception of innovative applications that can improve the lives of people around the world. Kerlink is growing its business by establishing partnerships with global suppliers and major clients, and expanding into new markets. The company established a subsidiary in Singapore to support its expansion in Asia Pacific in early 2016, launched a U.S. subsidiary in January 2017 established on office in India in September 2017. 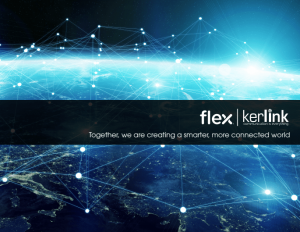 Kerlink also considerably extended its production and customer support footprint by signing an agreement with Flex to assure global availability of its equipment and production flexibility worldwide. Kerlink is also constantly improving its quality, operations control and processes through its Quality Program. It has been awarded the ISO 9001-2015 certificate by Lloyd’s register Quality Assurance (LRQA) for its IoT network solutions overall design, development, and sales processes. Since its creation, Kerlink has built a strong track record of deployments for key machine-to-machine (M2M) and IoT use cases in various vertical segments, such as fleet management, transportation & logistics, smart metering & energy, smart agriculture & environment, smart cities, building & facilities, industry and asset tracking. Kerlink is committed to making its multi-technology solutions scalable to meet fast-growing applications for Internet of Things connectivity worldwide. These major achievements reflect the global and individual commitment to develop a customer-centric approach and constant innovation path, to offer customers a unique service based on professionalism and efficiency, to ensure the company’s financial performance and sustainability, and to empower employees as a lever for customer satisfaction with strong ethical and loyalty values.